alaTest heeft 64 reviews verzameld en geanalyseerd voor Contour+. De gemiddelde beoordeling voor dit product is 3.8/5, vergeleken met een gemiddelde beoordeling van 4.0/5 voor andere Camcorders. Gebruikers waarderen het gebruiksgemak zeer. We hebben de consumenten- en expertbeoordelingen, de leeftijd van het product en andere factoren geanalyseerd. Vergeleken met andere Camcorders krijgt de Contour+ een alaScore™ van 88/100 = Zeer goed. Contour is one of the biggest names in POV cameras, and the company is really shooting for the sky with its Contour+ HD. The Contour+ is noticeably more expensive than the competition and Contour's other models. The flush-mounted lens glass seems vulnerable to scratching. The perfect accessory for your extreme sport, the Contour+ gives everyone the ability to see and hear what you do, not to mention it can also record stats and give live feeds with its optional equipment. Read more in our Full Conclusion. 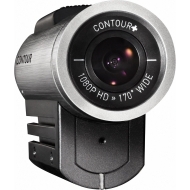 The Contour+, from extreme sports video camera company Contour, is a tough and compact camera that records Full HD video at a variety of quality settings and frame rates. If you're a thrill seeker who wants to take your audience along for the ride, the Contour+ is one great way to get them there. The Contour+ makes very nice vide and has nice features. The real downside is the cost difference between the Contour+ and the GoPro.